It’s hard to believe it’s already that time of year, but yes – we’re getting ready for our annual New England Celebrities Tackle Cancer Gala! Once again, many of my former teammates, as well as current Patriots players and other New England sports stars and celebrities, will join our Foundation for a night of fun, inspiration and fundraising for cancer patients, families and pediatric brain cancer research. Scott Zolak, a former Patriot and 98.5 The Sports Hub Midday Host/Patriots Color Analyst, will do the emcee duties, putting his broadcast skills to good use. In past years, we’ve been joined by Patriots Tom Brady, Matt Light, Troy Brown, Kevin Faulk, Jerod Mayo, Rob Gronkowski, Rob Ninkovich, Wes Welkerand Danny Woodhead, as well as local celebrities Greg Hill, Lisa Hughes, Bianca de la Garza and comedian Lenny Clarke. So we’re expecting a star-studded turnout! This is a special year for the Joe Andruzzi Foundation. 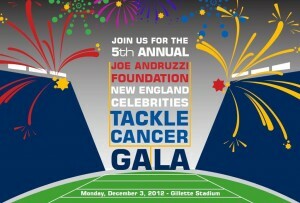 For the first time ever, the gala will be held at Gillette Stadium, looking down over home field from the Putnam Club. I’m excited to bring all of our friends and supporters together in a place that means so much to me personally. This stadium is full of awesome memories for me, and I can’t wait to make more. This year marks the fifth anniversary of our gala – our organization’s first truly big event, which has grown into one of our signature annual fundraisers (along with the Joe Andruzzi and Friends Golf Tournament). The money we raise at the gala helps our patient families cover household expenses and supports our initiatives all year long. It’s critical to our work. Of course, this is also my fifth year living cancer-free. I’m so grateful for my ongoing health, and what our Foundation has accomplished this year. We’re steadily meeting and exceeding our goals – assisting more families and funding more pediatric brain cancer research every year – and that’s humbling and inspiring. Last year, our gala raised more than $325,000, and we’re aiming to break our record! This year, the gala will be held on Monday, December 3, and we’re also excited to hold a pre-event symposium. The talk will feature “Caring for the Caregiver”, a presentation sponsored by Millennium: The Takeda Oncology Company and led by ambassadors of the biopharmaceutical leader. Lisa Marquette Porat, MSW, LCSW, OSW-C, President of ILP Solutions, Inc., will also lend her expertise to the session. A discussion on molecular advancements in the treatment of brain tumors will follow, led by Dr. Peter Manley, Director of the Pediatric Brain Tumor Outcome Program at the Dana-Farber Cancer Institute. We’re really excited about this educational piece, which is open to all gala guests. We’re also psyched to highlight our new (Up)Beat Cancer initiative and #JAFDailyDosesocial media campaign, and give love to all the hilarious kids’ sayings we’re collecting via Twitter and Facebook this fall. After the symposium, we’ll gather for a cocktail hour, where guests can buy footballs to be autographed by the many Patriots players and alums in attendance, bid on silent auction items and enjoy delicious culinary offerings. Then we’ll move on to a live auction – hosted by Boston radio & television personality Billy Costa – and our speaking program. As always, our guests will get to hear firsthand from our patient families, and gain insight into just how helpful the Foundation’s contributions have been for their loved ones. We’re also proud to welcome many new and returning sponsors this year, including: Presenting Sponsor Credit Union Kids at Heart, MVP Sponsor Millennium: The Takeda Oncology Company and Touchdown Sponsors The Home Depot, CVS Caremark and East Commerce Solutions Inc., among many others. The fifth annual New England Celebrities Tackle Cancer Gala will be a night of laughs, hope, generosity and memories – let’s come together to tackle cancer!